You have a lot of images and don’t want a fancy Flickr or big framework (ex zenphoto) to show them. You want only put your image folders on an ftp server and show them to the world. Easy as 123. Mininim album could be a one shot solution. I wrote it several years ago and now I decided to dust and share it because a lot of friends ask me a simple solution to have a nice web gallery of their holiday pictures or a simple photo portfolio. 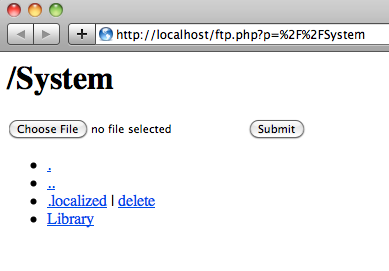 Download the file from the repository and put the “index.php” file on the server. In the same directory put your image folders. You can also download the file from the repository as zip. Use your ftp client (Cyberduck or Filezilla) to upload the file and your images. Remember to put always the images into a separate folder.